Market conditions are now ripe in India for start-ups. The middle class has rapidly expanded, smart phone usage is cheap and ubiquitous, the educated masses are hooked to the internet, and the population is young (more than 50% of India’s population is below the age of 25 and more than 65% below the age of 35). So, startups are making products and services to cater to the demands of a bold new generation of Indians. Note: Some 302 million Indians were using the Internet at the end of 2014, 42% more than the year 2013, according to the “Internet and Mobile Association of India”. Investors are also attracted to the untapped potential of India, whose population is 1.2 billion. Technical talent is widely available, with India producing 1.5 Million engineering professionals every year.However, critics point to India’s poor telecommunications infrastructure, the potholed roads, a slow postal-delivery systems, and largely cash-based economy as drawbacks to progress. However, this does not seem to be detracting investors. Industry observers say that the increasing number of exits and high valuations are giving confidence to investors. Instrumental in attracting investment into India is current PM Narendra Modi. The “Make in India” campaign aims to promote India as a prime location for global manufacturing. His government is reaching out internationally with: digital campaigns, road shows for potential investors, reduction of red-tape, and hand-holding of foreign parties through the process of setting up shop in India. Alibaba Group Holding Ltd, the Chinese e-commerce company, raised a record $25 billion in its initial public offering in 2014. Now, global investors are recognizing opportunities in India- rushing in with a ferocity unknownst previously. Amazon Inc.’s $2 billion bet on India’s tiny e-commerce market made waves in mid-2014, a challenge to the local rival Flipkart. Uber plans to invest $400 million in India, to expand its presence into new cities and hire aggressively. Foreign Investors include Moscow-based investment firm DST Global and New York-based hedge fund Falcon Capital Edge LP. Silicon Valley-based Accel Partners, which manages around $9 billion globally, has launched a $305 million fund for early-stage Indian technology companies. Japan’s SoftBank Corp., one of Alibaba’s earliest backers, invested more than $800 million into online retailer Snapdeal.com and Olacabs. Tiger Global, Sequoia SoftBank, SAIF, Lightbox VC, and smaller players like 500 startups, and Blume Ventures have each committed money to the country over the past year. India focused Helion Venture recently announced its fourth fund worth $300 million, which includes investment in India’s Housing.com, TaxiForSure, and Komli. Helion is consistent in targeting early to mid-stage tech startups in India. According to Helion’s Sanjeev Aggarwal, “The quality of entrepreneurs has raised”. India based investors are also plentiful. PremjiInvest, an investment firm owned by Azim Premji, chairman of software giant Wipro, has built a portfolio of approximately $16 billion. Infosys co-founder, Narayana Murthy, set up Catamaran Ventures in 2010 with a portfolio of $96.2 Million. In February 2015, Indian billionaire, Ratan Tata joined Kalaari Capital, a venture capital fund, as an investment advisor. E-commerce and transportation continue to be investor darlings, but areas like classifieds, digital wallet, and food have started generating interest. The value of many budding companies have skyrocketed, with Indian e-commerce company Flipkart Internet Pvt. now worth $11 billion, following a December investment of $700 million from U.S. investment firm Tiger Global Management and Singaporean sovereign-wealth fund GIC. 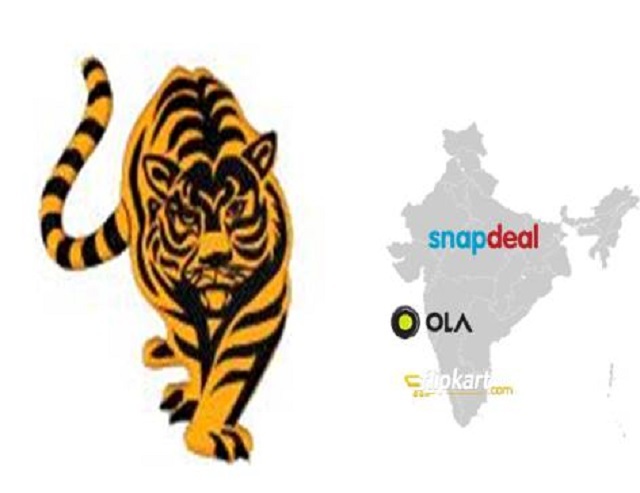 Snapdeal.com is valued at $2 billion; Web-based taxi-booking service Ola, a page out of Uber, is valued at $1 billion. None have realized a profit as yet. Other start-ups include Zomato ($50 million), Grofers ($35 million), MobiKwik ($25 million), ZopNow ($10 million) and PepperTap ($10 million). Ujjivan Financials raised $96 M. Analytics company, Manthan Software raised $60 M. Big data startup, Antuit’s funding totaled $56 M. CarDekho has attracted another $50 M. NewsHunt raised $40 M in Series C, CaratLane was funded $31M. Practo and CarTrade each have raised $30 million. Pepperfry has raised $15 M, FabFurnish is looking to raise $50 M and UrbanLadder’s funding is $50 M.The list goes on. To-date, 2015 has seen $2.36 billion in funding, more than thrice the figure for the first four months of 2014 ($716 million), according to estimates by VC funding tracking firm Tracxn!. It is eagerly watched as to how much investment will pour into Indian ventures by the end of 2015.